Born in Tel-Aviv, Rutu Modan (1966 - ) is one of Israel’s best known cartoonists. She graduted from art school in 1992 and quickly established herself drawing strips for Israeli daily newspapers. In 1994 she was offered to job of editing, with classmate Yirmi Pinkus, an Israeli edition of MAD magazine featuring reprints of US material supplemented with local originated material. The magazine shut down after 14 issues, but undetered in 1995 Rutu and Yirmi founded Actus Tragicus, an internationally acclaimed collective and independent publishing house for alternative comic artists, including Batia Kolton, Mira Friedmann and Itzik Rennert. 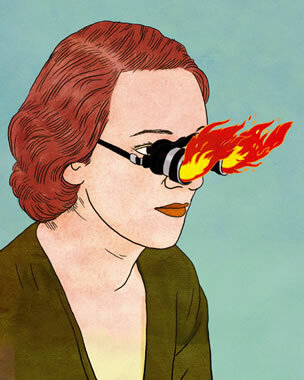 Rutu has worked as an illustrator for magazines and books in Israel and abroad, and has taught comics courses in Israel. She currently lives in Sheffield, England. In modern-day Tel Aviv, a young man, Koby Franco, receives an urgent phone call from a female soldier. Learning that his estranged father may have been a victim of a suicide bombing in Hadera, Koby reluctantly joins the soldier in searching for clues. His death would certainly explain his empty apartment and disconnected phone line. As Koby tries to unravel the mystery of his father’s death, he finds himself not only piecing together the last few months of his father’s life, but his entire identity. Exit Wounds is a profound, richly textured humane and unsentimental look at societal malaise and human relationships and that uneasy place where they sometimes intersect. 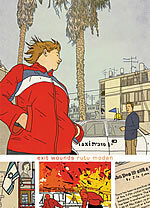 Rutu Modan is a deeply insightful writer and artist and there’s no question in my mind that Exit Wounds places her in the top tier of cartoonists working today. The main plot is based on an actual event, a body that was destroyed in a terror attack on a bus. This has happened before, unfortunately, but this time no one claimed the body. It seems it was a body of someone no one missed. A wonderful documentary was done on this event (No. 17 by David Ofek). The director tried to find the identity of the body. I saw the film and it was so strong. We would like to think that if we disappeared at least someone would notice - a relative, a neighbor, at least the vendor at our local shop. Although I’ve not experienced a terror attack myself, it was happening a lot around me a few years ago, and it did affect my everyday life and feelings. But sudden, brutal deaths are actually around all of us, anywhere, anytime, not just in Israel. (Every death feels sudden and brutal, even those called ‘natural’). I tried to describe this in Exit Wounds, and not just the dramatic side of it, but also the matter-of-factness of death and the everyday aspect of it. 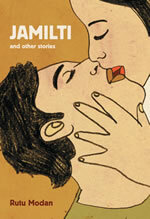 Jamilti & Other Stories collects Rutu Modan’s short stories which originally appeared in the Actus and Drawn & Quarterly comics anthologies. Most of the stories have some issue around old family photos. I have an obsession for family photos as objects as much as I have for families as a subject. The photograph focuses on a moment in life but hides a bigger issue, which is much the same as making a comic. Besides, it is really fun to draw from old photos.